We get asked this question pretty often. Some people feel we are invading their health privacy. Others truly don’t understand WHY that would matter when they’re just in for a routine exam. Still others KNOW their blood pressure is high and feel embarrassed having the conversation with another health care provider. 1) You probably see your dentist more than your primary care physician (PCP). Roughly 64% of people visit the dentist at least once per year. High blood pressure often has no symptoms, so having us check it, gives you an opportunity to monitor your health. 2) Taking your blood pressure before the appointment helps avoid a hypertensive crisis. Hypertension can cause damage to other organs, and detecting it early is helpful in treatment. Sometimes numbers can be so high that patients are asked to see their doctor immediately. 3) High blood pressure can be a sign of a silent killer disease. One of the most prominent diseases that can be detected is diabetes. As with hypertension, detecting diabetes early can help in control and treatment. 4) High blood pressure while pregnant can indicate adverse pregnancy conditions. For some expecting mothers, the presence of high blood pressure in the 2nd and 3rd trimesters can be a sign of a pregnancy condition called Preeclampsia, which can affect both mother and child. Knowledge of your blood pressure can ensure proper steps to treatment for this or other conditions are taken. 5) Your blood pressure results can help determine the appropriate anesthetic levels needed. If your appointment includes the use of local anesthetic, a blood pressure reading is necessary to choose the appropriate levels needed for procedure. Also, high blood pressure can detect an at-risk patient for some anesthetic treatments. 6) Many people never check their blood pressure at all. Checking it here in office gives us a chance to compare readings from visit to visit to see if anything has changed and, if so, alert you of the changes in your health of which you may have been unaware. 7) Blood pressure can indicate the presence of White Coat Syndrome. Nervousness and anxiety are common for people going to the dentist. For some, it might be a fleeting feeling, but others struggle with what is known as White Coat Syndrome. This leads to higher blood pressure while you are in the office. 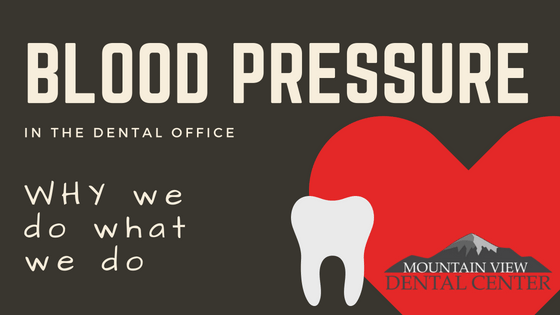 When patients are aware of their condition, they may be able take preventive measures to lower their blood pressure and understand what is happening when they come into any medical or dental office. It also helps us understand your readings and create an environment (as much as we can) that helps you relax.